At the Village du Port we’ve decided that your little tribe deserves to be thoroughly spoilt! Children, parents and grandparents... all the delights of bathing just for you! In the heart of a peaceful environment, close to your accommodation, you’ll discover a lap pool and an aquasplash (for the under 12 years), both heated. As we said, we’ve thought of everyone! And just a step away from the Village du Port, you’ll find 4 other aquatic areas equally certain to delight young and not so young: 500m² of heated pools with waterslides and paddling pools, our superb 600m² aquabulle with a host of fun games for your children, a lap pool with solarium plus a 360m² artificial lagoon... Fit for a king? Absolutely! 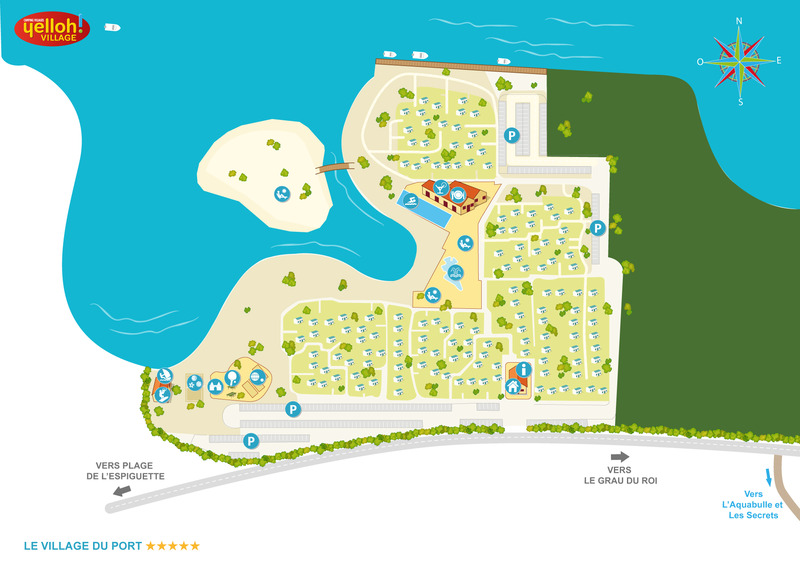 The Espiguette beach, sublime and unspoilt, is only 1,400 metres from your club village. As soon as you arrive and step onto its sand you’ll find yourself in a different world: 12 kilometres long, 700 metres wide, sand dunes by the dozen, the warm Mediterranean Sea... Don’t you wish you could be there now, immediately and without further ado! A little further away even more beaches await: Le Grau-du-Roi, La Grande-Motte, Carnon, Palavas-les-Flots... Between bathing, watersports and simply lazing, you’ll never have time to get bored. A holiday to dream of... no?